Wowsers, it's been a long break between macaron posts hasn't it? I completely admit to being utterly sick at the sight of them, after a frenzied month of macaron making, followed by a ridiculously excessive amount of macaron consumption in one day. But the amount of frozen egg whites crammed into a freezer reached critical mass the other weekend, so I heaved a sigh and pulled some out to defrost. I hadn't picked the best time of the year to make these, the weather has been incredibly humid in Sydney, and moisture is the arch-nemesis of the macaron. But I took as risk, and it was worth it in the end. I've had this flavour combination swirling around in my head for a while, because I always find a lot of macarons overwhelmingly sweet. 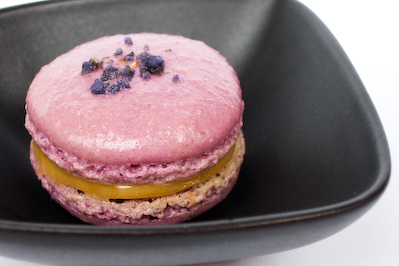 The thought of balancing the floral sweetness of a violet macaron with a bright yellow, tangy lemon curd was so appealing to me. Plus I will use any excuse to get more purple-coloured things in my life. At the moment I'm completely in love with my little bag of crystallised violets, and sprinkling them on top of anything makes it look delicate and pretty. 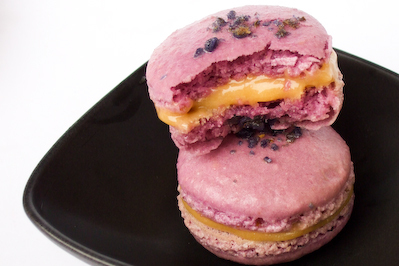 I decided to try Tartelette's violet macaron recipe for the first time, after hearing how much success so many people had with it, while adding in a few of the little tips that I picked up during the Daring Baker's month. Even after making so many batches, I was really rusty and I was using a new recipe with new oven temperatures and times. It was bound to have hiccups. And hiccup it did, the first batch looked fine going in, rose beautifully with feet, but I pulled it out of the oven at the indicated time and they were totally undercooked and their feet collapsed. Sadness! I blame my super thick silicon mat. I rallied and tried the recipe again the next day with a baking paper-lined tray sitting on top of an upturned roasting tray, and they turned out much better! Still not the prettiest macarons I have ever made, the mixture isn't as smooth as ones I've made before, and I forgot to add the pinch of egg white powder. 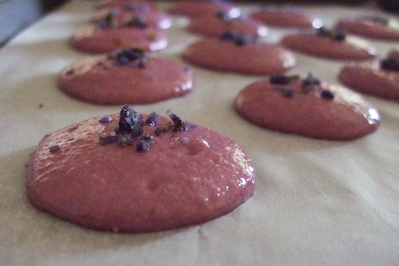 That only seemed to make the macarons turn out a little shinier, which I don't mind. Tartelette's recipe is as reliable as everyone says, it results in beautiful big feet and a perfect crisp shell. As for how they tasted, I loved the combination. My only gripe was that I made the lemon curd a little more sour than I would have liked, it seemed to intensify in the fridge overnight, and it also made the macarons a little wetter than I usually prefer. But they held their shape well enough, and the citrus-lovers that I shared it with were big fans. The day before (24hrs), separate your eggs and store the whites at room temperature in a covered container. If you want to use 48hrs (or more) egg whites, you can store them in the fridge. Alternatively, any time that you have extra egg whites, you can pour them into ice cube trays and freeze them. Once frozen, pop them out of the trays into ziploc bags and store in the freezer until needed. The day before, weigh the correct amount of egg whites you need and place in a ziploc bag in the fridge to defrost overnight. Remove from the fridge and allow to come to room temperature. 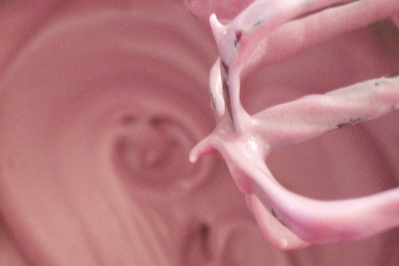 Using a stand mixer or electric beater with a whisk attachment, whip the egg whites (you can also add 1 tsp of egg white powder to this for increased stability) to a foam, then gradually add the sugar until you obtain a glossy meringue. 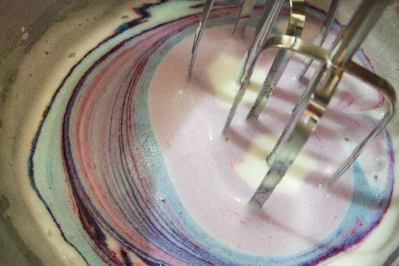 I usually beat the meringue to soft peaks, then add my powdered food colouring and then beat to stiff peaks. 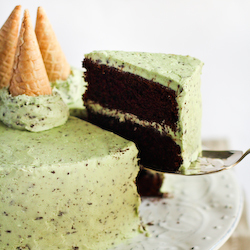 Some people prefer to add the food colouring to the almond meal, but it's up to you. Do not use liquid food colouring. Do not overbeat your meringue or it will be too dry. Spread your almond meal out on a lined baking tray and dry out in a cool oven (around 100 degrees C). Remove from the oven and cool completely. 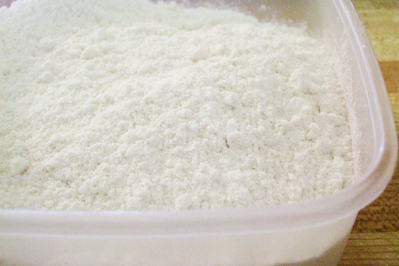 Place the powdered sugar in a food processor and pulse to remove any lumps. Then stir in the almond meal and give a few more quick pulses to combine the two. Add them to the meringue, giving it a quick fold to break some of the air and then fold the mass carefully until you obtain a batter that flows like lava or a thick ribbon. Give quick strokes at first to break the mass and slow down. It's important to get as many of the big air bubbles out, air bubbles are bad. The whole process should not take more than 50 strokes. Test a small amount on a plate: if the top flattens on its own after around 20 seconds you are good to go. If there is a small beak, give the batter a couple of turns. Fill a pastry bag fitted with a round tip with batter and pipe small rounds (around 3cm diameter) onto silicon mat lined baking trays, or baking paper lined trays. Bang your baking tray gently on the counter to remove any remaining bubbles. 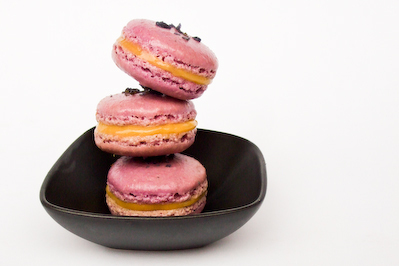 Crush up your candied violets in a mortar and pestle and sprinkle a pinch of violet sugar over the tops of each macaron. Preheat oven to 140 degrees C (280 F) and let your macarons sit out on the counter for 30-60 minutes, to allow the shells to harden slightly. If using baking paper lined trays, place on top of an upturned metal roasting tray and then bake for 15-20 mins, depending on their size. Let cool and then remove very gently from tray and cool completely on a wire rack. If you have any trouble with the macarons sticking to the tray, you can pour a few drops of water under the parchment tray while the tray is still warm to steam them off, but don't leave it too long or they will get soggy. Alternatively you can try to place them back into your cooling oven for a few minutes after it has been turned off before trying to remove them. 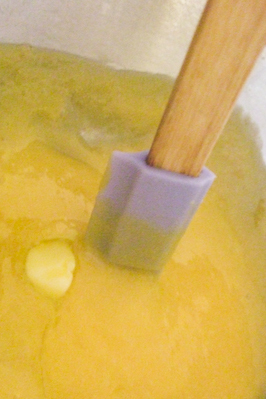 While the macarons are cooling, prepare the lemon curd. Stir the sugar, lemon juice and zest in a small saucepan over medium heat until the sugar dissolves. 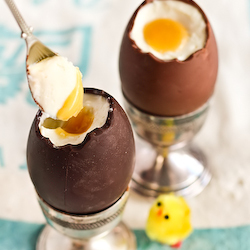 Beat the egg yolks in a heatproof bowl and gradually add the hot lemon mixture. Strain the mixture through a fine-mesh sieve. Return to the heatproof bowl and place over a saucepan of simmering water. 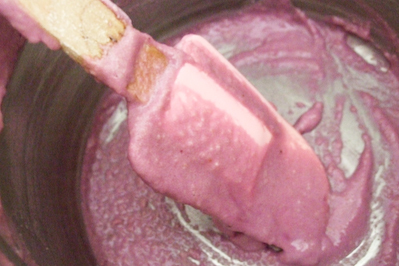 Cook, stirring continuously, until the mixture coats the back of a wooden spoon. Do not allow the mixture to boil. 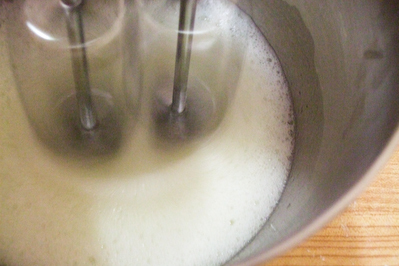 Remove from the heat and add the butter cubes, one at a time, stirring until fully combined. If the mixture is still too sour for your liking you can stir in some powdered icing sugar to your taste. Cover mixture with baking paper and refrigerate for 30 minutes, or until it firms up. When you are ready to fill your macarons, spoon or pipe around 1-2 tsp of lemon curd filling sandwiched between two macaron shells, then refrigerate for 30 mins to allow the filling to set. Serve on the same day, or can be stored over night in the fridge in an airtight container. Hehe I recognise that bowl - big love to Wheel & Barrow! 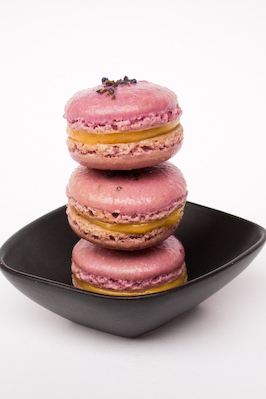 :D Gorgeous macarons and as a fellow citrus lover... omg I want! 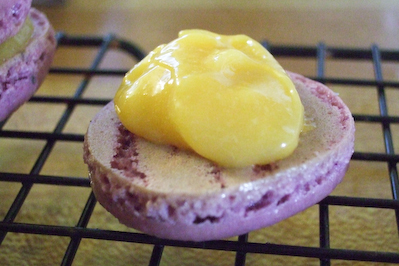 Lemon curd seems like the perfect addition to those macarons! Looks gorgeous, what a fantastic combination. 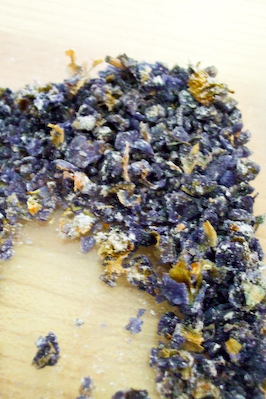 Where did you get the violet sugar from? I can't seem to find it anywhere! 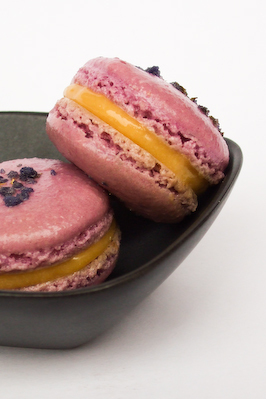 You're right about macarons being too sweet; the lemon curd sounds like the perfect antidote! I love lemons (had one for dessert the other night) so lemon curd is just sweet enough! 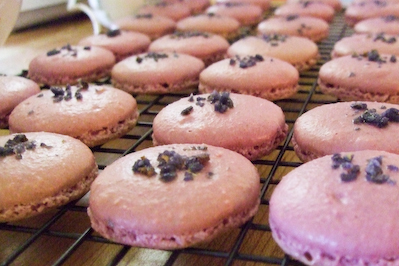 my first attempt at macarons was a big fat FAIL, but your detailed instructions got my baking juices going again. maybe if this weekend will be quiet i'll give macarons another try... these look absolutely fantastic steph!! Wow, what a pretty colour macaron and the photo with the colour being mixed in to the mixture is awesome! incredible - i'm new to macaron baking and am trying to learn the essentials! 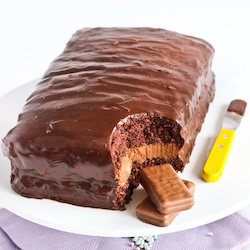 i have to wait until I go back home for an oven with a fan, until then I will have to wait to make these! I have a lot of egg whites leftover from this month DBC but still a little overdosed from making macarons. I may just go ahead to make a batch after your post. The colour is so pretty. Love the flavor combo. Nice color on the macarons! They look great Steph. So pretty. Can I have some? I cant seem to find Egg White powder. Which brand do you get and where can I find it? Oh they look great Steph! I was just wondering where you get your powdered food colouring from. I've been using the liquid one and have a sneaking suspicion that this is the reason why some of my macarons didn't turn out that great..
Phuoc - Thank you! 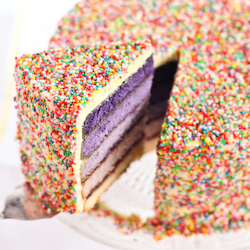 I got my powdered food colouring from The Essential Ingredient (http://www.theessentialingredient.com.au/), but you should be able to get it from any cake decorating store. I know there's one in Castle Hill which has an online store (http://www.cakedecoratingcentral.com/). 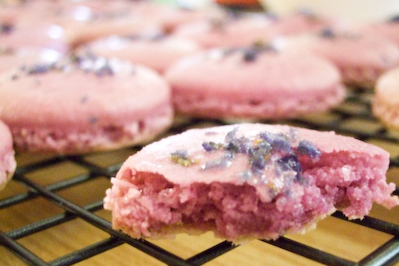 Yep, liquid food colouring can cause havoc when making macarons, I think it upsets the dry-wet ingredients balance! Chocolate Shavings - It's great cos then it's not too sweet! Thanks! Zina - Thanks so much :) I got my pack of crystallised violets from The Essential Ingredient but they were really expensive! Belle - :) I know, they can get to the point where it almost hurts your throat! Thanks! Trisha - Oh no!! Yeah they are tricky little buggers, maybe you should try the Italian meringue method? I did that for my first time because it's harder to screw up! Rilsta - Haha I love watching the food colour while it's swirling in! FFichiban - Haha I wouldn't go that far! I'm in training ;) Thanks! Conor - Heehee good to know it ticks the important boxes! More thing should be purple! chocolatesuze - Hehe as soon as I saw it making the pretty swirl I was grabbing for my camera! linda - :) thanks! Haha you can have some of mine if you want! I seriously cannot believe you miss them after the massive amount you baked. you crazy! Lorraine - Same, it's good that such a small bag goes such a long way, gotta make it worth every penny! A cupcake or two - I got my egg white powder from The Essential Ingredient, not sure where else you might be able to get it from! vickys - Oh yeah it's so easy to get obsessed! Haha I still wish they were smoother, there's always room for improvement! Good luck with yours! Sigh. They are gorgeous. Pics, recipe and styling. Aww shucks Trissa! Thank you :) Haha I still have a long way to go styling wise!